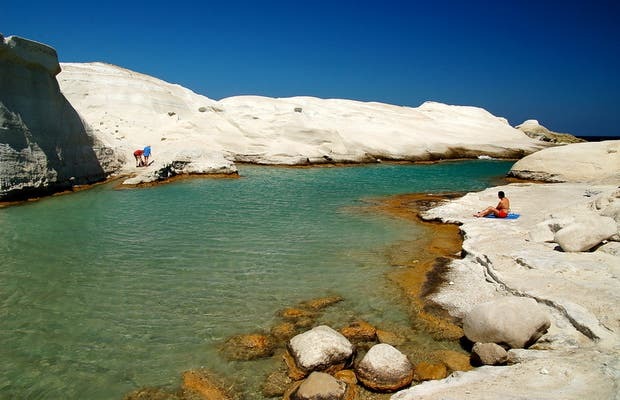 It's difficult to choose a favorite among the many amazing beaches on the island of Milos, but Sarakiniko beach will certainly appear on this list, regardless of who you ask. It's a unique blindingly white beach made of limestone instead of sand. The beach is of volcanic origin, and it's the only example of this peculiar rock formation you'll find on the island. The simple geological interest combined with a stunning blue water makes it one of my favorite beaches on Milos. About a kilometer from there, you can find the famous shipwreck of Milos, another thing worth seeing. Sarakiniko is impacting...it's beauty is so unique and the contrast of the white rocks with the turquoise sea is incredible. If you don't like the heat, make sure to come prepared as there's absolutely no shelter or cover around. If you do like the sun then...well, perfect!